Department before the closing date of 07-12-2018 along with all supporting document copies. 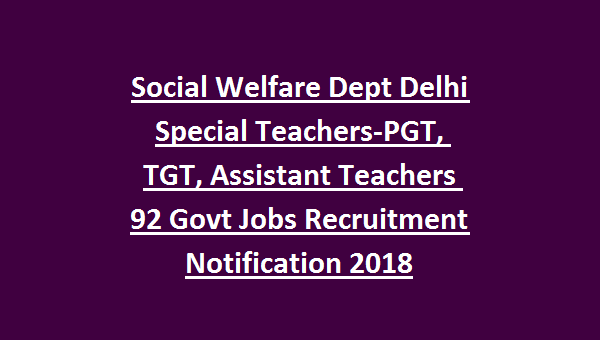 There are total 81 Special Teachers jobs int this Delhi Social welfare Department recruitment 2018. Candidates selection will be based on walk in interview only. Walk in interview date is not at announced. Application form is available for download at www.socialwelfare.delhigovt.nic.in. Detailed information about this Delhi Social Welfare Dept Trained Graduate Teachers, Post Graduate Teachers and Assistant Teachers recruitment is given below. These special teachers posts are for the Deaf & Dumb Schools, Mentally Retarded Children Schools and Blind Schools. 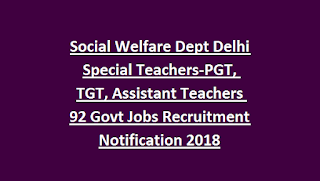 There are total 90 posts in this PGT/TGT and Assistant teachers jobs recruitment Delhi Social Welfare Department. Candidates selection will be through walk in interview for this Delhi Social Welfare Dept Special Teachers jobs. Eligible candidates download the application form from official website of www.socialwelfare.delhigovt.nic.in. Last date to submission of application form by hand or through post to Delhi Social Welfare Department is 07-12-2018.